If there is one thing I like to be certain of when I shop, it's that I'm getting the best possible deal. When it comes to shopping online, it's easy to quickly search for a coupon code before placing my order, but what about when I'm shopping in a store? Even when I do receive mailers from my frequently shopped favorites, I never remember what the sale dates are, or to bring the coupons with me. Now with the effortlessly simple app Shopular, I never have to worry about that again. Shopular is linked up with hundreds of stores and has a constantly updated database of all the active coupons, as well as the weekly flyers and deals. By allowing the app to use my location, it will even send me a push notification of a deal when I enter a store. 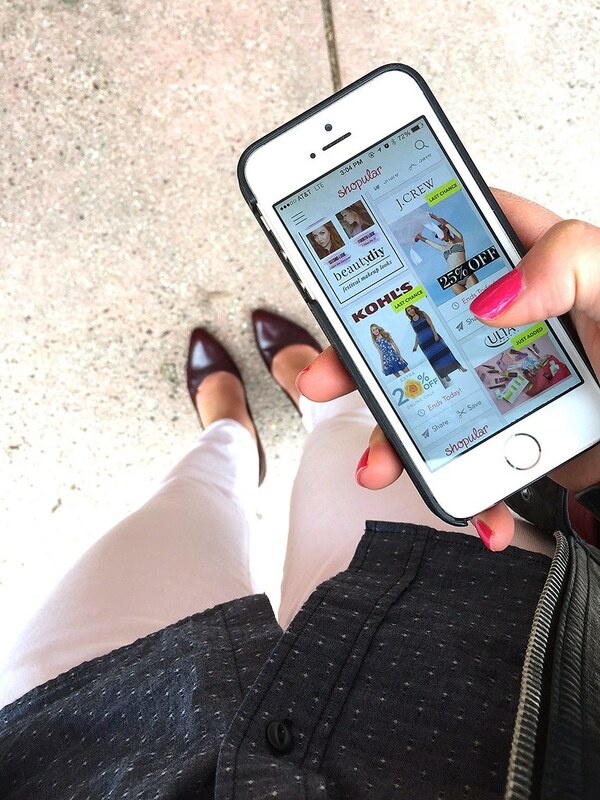 One I downloaded Shopular, I added all the places I love to shop to my favorites list - everything from Banana Republic to Starbucks, and then I could view a feed of all the active coupons. I went into Kohl's but forgot my mailer - no problem - I opened Shopular and had a coupon with barcode that could be scanned at the register. Did you know that Starbucks was offering a BOGO deal on their Chai Tea Lattés? I did, because Shopular let me know! The app is a free download, so why not give it a try? You've got nothing to lose and only savings to gain! This post was sponsored by Shopular, however my views an opinions are my own. I'd never heard of them ! Here coupons are non existent.. I'm not usually one for downloading tons of apps - except the photography ones, of course - but this sounds brilliant. Definitely going to be downloading it, because I hate finding out about a discount just after I've bought something at a higher price. Fingers crossed it works just as well in Canada! That sounds like one amazing app!! This sounds awesome, I will have to check it out! Have a nice day, Lydia! I have this app! I just need to use it more often...I keep forgetting to check it!